Just a point of clarification around the Tongariro Recreational Releases over the weekend. 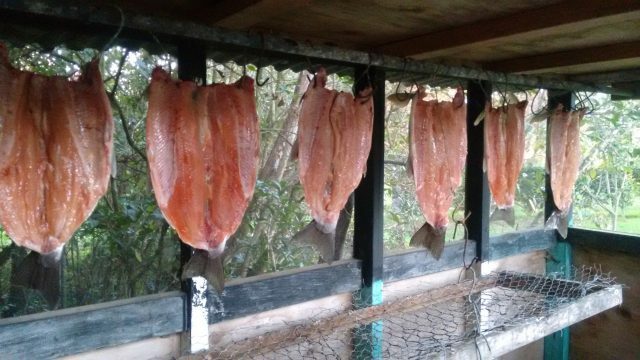 The scheduled Rec Releases were for Saturday from Poutu Intake (which went ahead) and on Sunday from Rangipo Dam. The Rangipo release on Sunday was cancelled because of the heavy rain and the lack of ability to control the water flows, thereby allowing the delivery of a known quantum of water. Rangipo Rec Releases are achieved by spilling at the Rangipo Dam, not by opening up the sluice gates. Sluicing sediment from the Dam requires a specific set criteria to be met and those criteria were not met on Sunday, so the sluice gates were not opened. 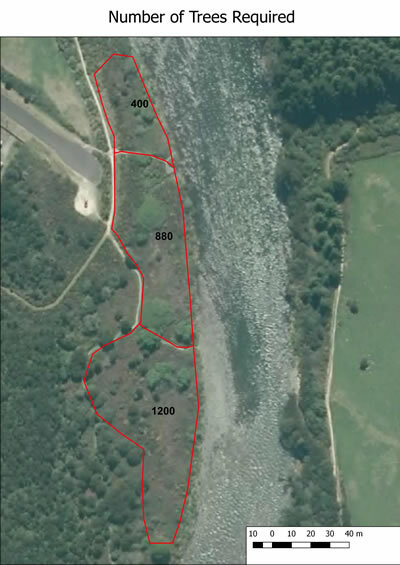 The dirty water is, we think, a result of some slips in the headwaters of the Waihohonu River and Mangatoetoenui, which have (naturally) been adding a large sediment load to the river for the past couple of months. There is a helicopter flight today, in fact, to help understand why the sediment load of these tributaries continues to be so high. Simon’s PhD thesis is available here. This is a stable link so please feel free to add this link to your website. Simon’s thesis is also in library under key documents. If you are available to help it would be much appreciated. Thanks for being part of this restoration project! This is our 2nd planting at this site, and we’ve learnt a bit from last time! Thanks Dave Cade for offering such wonderful help in the form of team members helping to scrub bar the final area (‘area C’) and organising the use of a ‘LUV’ (a quad bike with a cage) and trailer to move the plants from the back of the delivery truck, over the stock bank and to the planting site. This will make the start of the day so much easier!!! 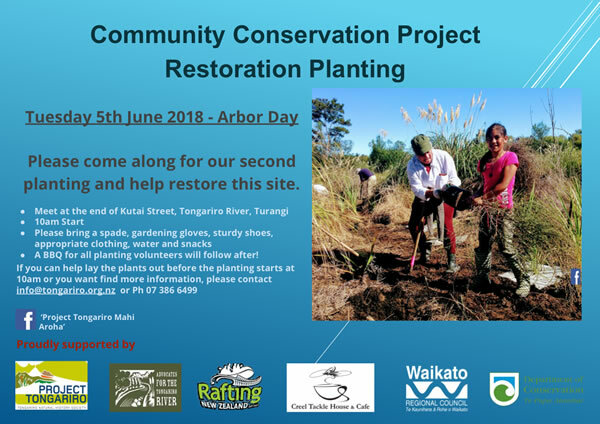 We are planning on meeting at the end of Kutai Street, beside the Tongariro River at 8.30am to arrange the plants ready for planting which will start at 10am. There are 1,200 plants to plant. Once planting is nearing completion, we will spark up the PT BBQ – please join us for this! Pianika – if possible, can we have some of your fit and strong staff to help move and lay out the plants in the morning? And if anyone from your team can join us (kids included) for the ‘planting’! Eric – please pass on the planting day details – I’ve attached a copy of the poster to this email, and I will be delivering posters around town this afternoon. I will also create a face book ‘event’ so please also share this. Please fire me any questions if I’ve missed anything. I have been away again and not fished for a while. 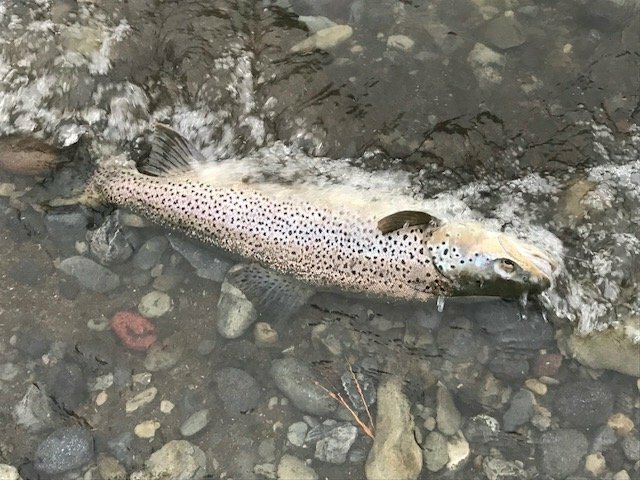 The reports I have received indicate that there are few anglers around and that the fish have not yet started the big runs to attract anglers. However there are fish at the delta as this photo shows and many of the fish are of good quality and size. Before going away I did catch and keep two small fish (just under 40 cms) which when opened were beautiful colour and full of roe close to spawning. It made me think that previous size limits allowed these fish to spawn and cause me to wonder the impact on the fishery of small fish spawning. In my absence, a friend who came to fish, told that there had been another small flood of about 220 m3per second. He managed when the flow rate dropped to 80 m3per second to land two brown trout on the river edge. One is pctured below. There is the strong influence of winter. I don’y mind the cold but the wind chill makes it much colder than the temperature indicates. As I write the sun is shining but there is still a strong wind. Only the very tops of the ranges have snow but Mt Ngauruhoe was white as we returned across the Desert road an Sunday. I feel for Dairy farmers and the stress created for them by the Mycoplasma bovis infection. There is an estimated cost of $870,000,000. Yet it currently affects, according to this mornings Dominion Post, 240 farms out of 12,000 herds nationally. I think those farmers unaffected are keeping an anxious watch on their farms and hoping that they will not be affected. So as an angler with more than 50 years enjoyment from trout fishing it is my desire that my grandchildren and all that follow can enjoy the experience that I have had. 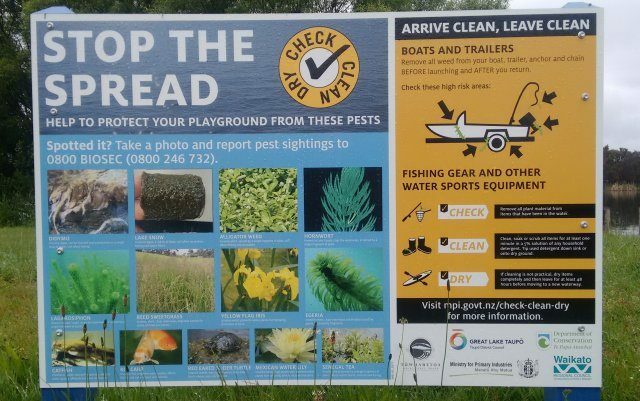 Aquatic pests are many. There is Didymo. Lake snow. Hornwort. Snapping turtles. Catfish. The list is long. The point is that in order to keep what we have to enjoy today we must all play our part. Keep clean gear. Check Clean Dry is all that we have but it is our vigilance that is crucial. This is more so when travelling between different rivers and areas of the country.